Dubai, UAE, November 19, 2018: The Holiday season is finally approaching us! This means the time of year has come around where need to think of gift ideas for our families and friends. This season our Festive Gift Guide wants to help you choose the best eyewear for the right occasion. 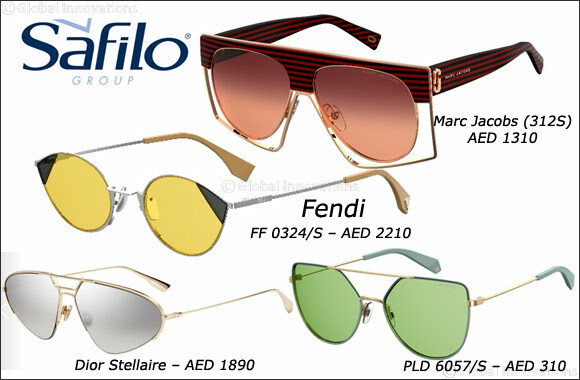 Safilo Group’s has the most stylish pair of sunglasses from the likes of Fendi, Dior, Jimmy Choo, Marc Jacobs, Givenchy, Hugo Boss, Polaroid and Carrera. For the girl that loves her colour, these stainless-steel rounded sunglasses are fun, effortlessly chic and can brighten anyone’s day. Strong yet delicate, these new sunglasses are inspired by experimentation in mixing colors and materials: the small cat-eye shape in ultra-light stainless steel is emphasized by contrasting colors in cosmetic nuances, thanks to an innovative construction embedding the two lenses together to celebrate the iconic FENDI color-blocking aesthetics. These Dior Stellaire frames are the combination both elegance and luxury, this is a timeless gift - Something that will stand out with every occasion of the year. Make a change in your wardrobe this festive season with the chic GIVENCHY-GV 7079S. These sunglasses are the perfect addition to his outfit on a causal day out with friends. They are guaranteed to make him look stylish yet modest. These sunglasses are the perfect addition to a causal day out. Manly yet chic, these sunglasses represent confidence. These sunglasses are the perfect gift for all types of styles. Does your man love the old school shape of sunglasses? Then he will fall in love with these retro aviator sunglasses from Carrera. Perfect to pair with jeans a v-neck top and he’s good to go.